Join Chandra for an hour of deep relaxation. The gong has been used for thousands of years for ceremonies and healing. Gong sound healing can offer physical, emotional and spiritual healing through deep relaxation, cleansing the subconscious mind and stimulating the glandular system. 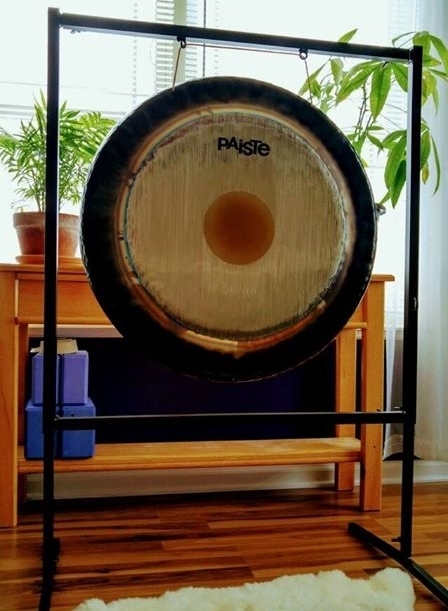 It is a type of sound therapy fondly named “the smart person’s meditation” as it can bring the mind to a neutral state but only requires you to be open and to allow the sound of the gong to wash over you. Group classes focus on deep relaxation while private sessions are designed to target the needs of the individual client. What to bring: Yoga mat, blanket, and your props of choice to support deep relaxation. Otherwise, you are welcome to use the props that we have available at Marcela’s Yoga Boutique. Chandra is a 200-hour, KRI-Certified Instructor and gong practicioner offering both Kundalini Yoga classes and gong sound healing. She studied Kundalini under Gurudass Kaur, a student of Yogi Bhajan, and gong therapy under Mehtab Benton, originator and author of Gong Yoga. Her heart-centered style is grounded in the meaning of her name, “the one who glows with the moon’s reflection of God’s love and beauty”. Committed to her role as a teacher, Chandra is currently working towards her 300-hour Kundalini Yoga teacher certification. She also holds a Reiki Level 2 Certification and integrates this knowledge into her teaching. Focusing on the needs of her students and clients, she provides an inviting and supportive atmosphere to her classes and private sessions.